As with all heat exchanger machines, temperature is controlled via the cooling flush. For more information on flushing techniques please read the article How I Stopped Worrying and Learned to Love HXs. Once heated, I noticed that the machine took less flushing than I anticipated. Both for the initial cooling flush as well as intra shot cooling. A quick email to Jim at 1st-Line answered the question. The Super has a flow restrictor in the upper thermosyphon line. That keeps the group temperature in check even during extended idle periods. My machines idle group temperature stabilizes at 200F give or take a degree. Even with idle periods in excess of four hours the group never got over 202F according to the thermometer I fitted into the grouphead water path plug bolt. I have played with the dosing, spanning from 14 to 18 grams. At the lower doses I had some difficulty with channeling. That is not to say I could not get a good shot at a low dose, I was just having some difficulties. The shots were OK at the higher end of the spectrum with lots of body in the cup, but the more delicate flavors were absent. Beyond 18 grams, the puck scraped the shower screen. In the end, I have settled on a 16 gram dose with most coffees. Espressos from the Super are typical to slightly better than other E61 machines I've tried. It produces a thick and crema laden shot, provided your beans and grinder are up to the task. The deep flavors (i.e., chocolate/cocoa/leather) are abundant in the cup. The mid tones (i.e., nut and spice) are the next most accentuated flavors with the lighter, more delicate notes coming across a little more muted. The cup is more of a melange, all the flavors are there but not as defined as the shots from my regular setup, the Elektra A3. Perhaps this is an unfair comparison given the vast differences between the two machines. Closer to home, I find cup qualities of the Super are slightly more rounded than my other E61-based espresso machine, the Isomac Millennium. 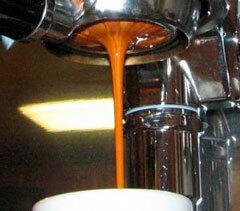 The pressure ramp is typical of most vibratory pump driven espresso machines. A 4-5 second preinfusion followed by the system coming to full pressure. As with most vibratory pump machines, you have a pressure drop when the heating element engages. This slight drop is nothing to worry about. Allow the espresso machine to heat for 45 minutes to an hour. Draw water through the group to purge the heat exchanger of super-heated water. The flush amount varies by boiler pressure and desired temperature. Generally speaking it's a few ounces if the machine has been idle for awhile and a brief 1 to 2 ounce squirt if it's been used in the last 5-10 minutes. Level the grinds in the basket (need hints? See the site's Recommended Reading). Tamp the coffee level using even and consistent pressure. Lift the brew lever or push the appropriate brew button. The pour should be slow and even, the stream color starting as hazelnut with striping and ending when the stream blonds and becomes translucent. I found the stock Faema style double basket to work well with a 14-17 gram dose depending on the coffee. Above 17 grams and there is insufficient headspace, below 14 and you are pulling near single shots. I also found the extreme overdosed and under dosed shots to be very temperamental and prone to channeling. 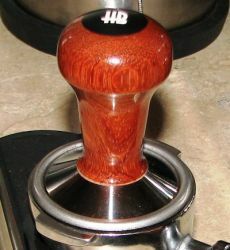 Using a Reg Barber tamper, a 15 gram dose of coffee puts the top edge of the tamper just below the rim of the basket. This allowed enough headspace for puck to expand but not contact the shower screen. The shots flow thick and syrupy with nice tiger striping. The double shots present themselves with more clarity than most E61 group espresso machines. The Domobar Super appeared to have more mid tones in the cup. While most machines will favor either a bright and vibrant or deep and mellow shot I was getting a well rounded cup. All the flavors were present, a little fruity, sweet, nutty with a touch of cocoa and a sweet and floral nose.